With the holidays finally over, decorations stowed and New Year’s resolutions made, life’s tempo changes. February comes and the blahs of winter hit you square in the face. Weeks and weeks of winter lie ahead with no end in sight. Slippery walkways and dangerous temperatures force you and your dog indoors for more time than you both prefer. The solution is simple: Break the cycle with healthy activity. Together, you and your dog are a productive and dynamic duo! 1. Safety First: Start with a padded, non-skid surface such as a foam yoga mat or carpet runner. Never exercise on a wood or tile floor. It’s important to make sure your dog’s nails are trimmed and the long hairs between paw digits are clipped. Wear your yoga or sweat pants, so you are comfortable and can move freely. Start all movements slowly and work up to a comfortable level of activity for 5 to 10 minutes initially. An average “duo” exercise session is about 15 minutes. 2. Use Sensory Enhancement: This includes music, small bite healthy pet treats and dog toys to facilitate movement. These elements will create a more enjoyable exercise experience. Remember to clap, sing and converse with your dog during the activity. Dogs love to hear your excited, happy voice! 3. Stretch: Combine stretches, balance and core strengthening for an efficient yet effective exercise session. Start with exercises that are familiar to you and find ways for your dog to join. 4. Learn a New Trick: Use your imagination, try some new movements and add them to your usual routine. Observe your dog participating in the activity and don’t be surprised if he or she teaches you some new moves! 1. 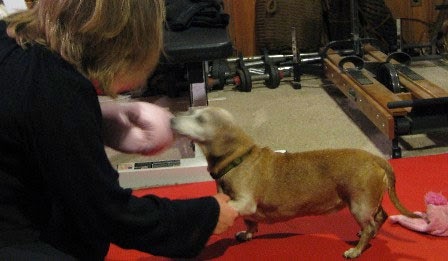 My “tweenie” Dachshund Penelope and I are in our basement on a red foam exercise mat. I am holding a favorite toy overhead, while she looks up and extends her spine and neck with a slight turn to the right. This helps strengthen her spinal muscles, while I use my shoulder deltoid muscles and stretch my hips. We stay in this position for 1-2 seconds, and repeat it several times. I switch to using my right arm and Penelope moves to the other side, using her left spinal muscles. 2. Here is a combination of human core stabilization with canine hip and stifle muscle strengthening. While I perform a partial abdominal curl and double leg lift, Penny walks under my raised limbs. 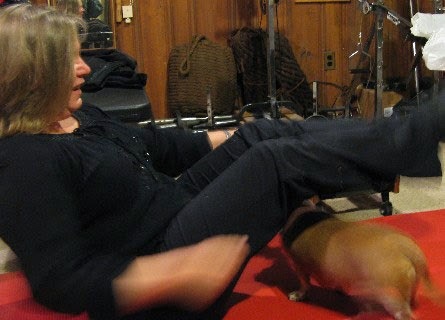 The exercise forces her to bend her hips and knees to a degree greater than with normal locomotion (even for a Doxie!). I lower my legs further with every repetition, which challenges both of us. I use a small treat for Penny to follow. While I tone my abs, Penny strengthens her quadriceps and gluts. 3. Combine leg stretching (me) with dog coordination. I hold a sustained hamstring and thigh adductor stretch, while Penelope makes a series of circles and loops under, over and around my knee (following a toy or treat). Do this several times in a row, and then switch sides. 4. Okay, I admit that this one is more challenging for the dog than me! With a larger dog, the human will stand and exercise his or her hips and thighs. With a small dog, the human will only experience some upper spine movement. Dancing is a good exercise for many dogs. Start with a “static” position for a few seconds at a time, and then add shifting from side to side and forwards to backwards. Remember, your dog’s paws should make constant contact with the mat. Progress with “dynamic” dancing, guiding the dog forwards, backwards and sideways as he or she takes small steps with his or her paws. It’s important to always hold the dog by his or her upper arm instead of only the paw. 5. Improve your dog’s balance. Start by using a visual aide to get your dog’s attention, while you passively and gently lift one limb. This forces the dog to balance on three limbs. Hold each paw up for 3-5 seconds. Work around the dog’s body to lift each paw. You can position yourself in a double kneel or a half-kneel, with one knee up and one down, to challenge your core and equilibrium. 6. Throw in some love and affection at the end! While I do my double leg lowering with core stabilization, Penelope performs dynamic core work by balancing on my torso. I provide some light manual contact with my hands near her hips to “check” against her falling. The nose rubs and kisses are the reward for your workout! It’s easy to modify the above exercises, so that you are in a standing position with your feet placed widely apart either side by side or front to back. Bend your knees slightly, contract your core and pelvic floor muscles. This will allow you to exercise your body, while also moving with your dog. 1. Use chairs placed a few feet apart for the dog to circle around while following a treat or visual cue. Repeat the same exercise in the reverse direction. 2. Raise one of your legs for the dog to walk under. This will help strengthen your dog’s thigh and hip muscles, while you try to maintain your balance! 3. Kneel, with one of knee up and the other down, having the dog circle around you and even climb over your raised knee. Endless possibilities exist for exercising with your dog indoors. I hope these examples inspire you to create a fun routine with your dog this winter! Susan E. Davis, PT Susan Davis is a New Jersey licensed Physical Therapist with over 40 years of clinical experience, graduating from Northwestern University Programs in Physical Therapy, 1977. She worked with human patients for the first 30 years of her career in hospitals and in her own private practice. In 2008 she made a transition into the veterinary world, working exclusively with animals, after having completed coursework and training in canine rehabilitation. Her current practice is Joycare Onsite, LLC and she provides Physical Therapy to pets in their home, in clinics, animal shelters, farms and zoos. Susan works with dogs, cats, rabbits, birds, farm animals, exotics and wildlife. She devotes one day per week to pro bono care at the Monmouth County SPCA. Susan is a writer and author of 2 books: “Physical Therapy and Rehabilitation for Animals: A Guide for the Consumer”, and “All Hands on Pet!” She has written extensively for various dog and pet-related blogs, including Dawg Business: it’s Your Dog’s Health and Veterinarians.com. She participates annually at the Westminster Dog Show as a medical member of their media team. Susan is a member of the International Association for Veterinary Rehabilitation and Physical Therapy and the Monmouth County Chamber of Commerce. Connect with Susan Davis on Linkedin and Twitter.